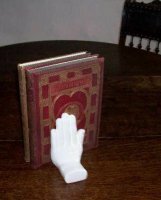 Pure white ceramic handy book ends. Not a suitable present for a priest as they decline to pray being both of the left persuasion. Alternatively you could, we suppose fill them with Jenever or some equally potent alcoholic beverage for that secret midnight tipple but we doubt if the bungs (or stoppers) are watertight and we know from experience that books do not like standing in a pool of booze = Bad idea.